Imagine a world dominated by machinery, moving products without human intervention, only finally touched by a human at the packing to go to a customer stage. 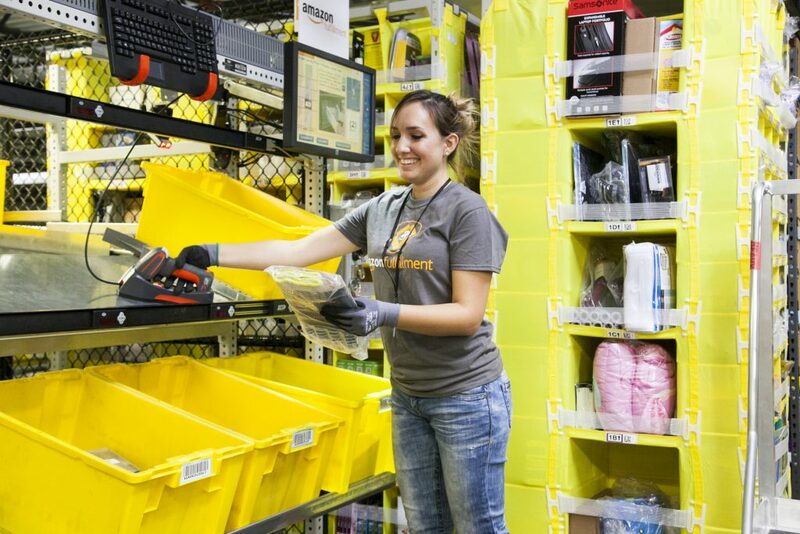 Gone are the days of pickers walking 10-13 miles a day on their Amazon shift; the new Amazon Fulfillment Center is more characterized by the lack of moving humans than their presence. Over time, the Fulfillment By Amazon process has become almost totally hands-off. Into this atmosphere, your packages must go. How do you decide which settings are in YOUR best interests as a seller, rather than Amazon’s? Amazon wants to make the experience with Seller Central to be as functional as possible for sellers. Notice I did not say user friendly, or smooth, or focused on experiential elements! Simply put, they prioritize function over form, every time. One of the areas that this is blatantly obvious is the FBA Settings (Go to Settings and Fulfillment by Amazon). Fulfillment by Amazon is when Amazon ships your items for you. You retain legal ownership of the goods (physical ownership is debatable, given how little control Amazon allows you once they hold your products). The best aspect of using FBA is the little blue PRIME badge next to your product’s listing. NOTE: Sellers who fulfill order themselves can also get the PRIME badge. The Seller Fulfilled Prime badge. But there are a lot of caveats to that, the most important one being that it’s region based. That means it only shows as Prime to customers who are within your Prime delivery zone. Otherwise, it looks like any other merchant fulfilled listing. So let’s dig deeper into each of these settings and what they mean. For the full explanation, click on “Learn More” on the Settings page. This is not a rehash of what Amazon tells you; rather it’s a Tips & Pitfalls guide on the areas I see sellers get into trouble with their FBA settings. In the very first section, you have a labeling setting. You can use Amazon’s labeling service, or label your own items, and there’s a note about using an Amazon Barcode. The Amazon Barcode is the FNSKU, or Fulfillment Network Stock Keeping Unit. The Manufacturer Barcode is the UPC/EAN/GTIN. Amazon’s labeling service is an inbound receive team that is responsible for making sure that all items coming in to the FCs (fulfillment centers) without labels have them. We always recommend using Amazon Barcodes. We have seen too many hijacked listings, inauthentic warnings, and other enforcement action because one seller’s good inventory was mixed with bad. A seller of lower care and due diligence. Don’t let someone else’s shortcut become your downfall. As an Amazon employee, I never relied on the FCs for anything that needed to be done perfectly 100% of the time. Overall they are very efficient and quite cost effective. But when I managed the Recalls team, I considered it too risky to use FC employees to relabel products (for example) to satisfy the requirements of the recall. Instead we ensured all units were returned to sellers and vendors to remedy their own inventory. This is because there is a relatively high error rate in the FCs. So you need to balance the convenience against the potential cost if they get something wrong. If you keep your replenishment numbers relatively low, say 3-4 weeks of cover, you may be fine using Amazon’s labeling service. There isn’t that much to remove if there is a mislabeling issue. You may imagine I’m also not a fan of using Amazon for any sort of prep. The fact is, they’re so large they don’t have to care about you. Your employees or a smaller 3PL will be more interested in ensuring your products get to customers safely and correctly. Distributed inventory placement or not? It’s typically easier for companies selling smaller items to just go with distributed inventory placement. However, with heavier items or items requiring more effort to pack, it may be worth paying Amazon’s fees to ship everything to one FC. Additionally, any seller shipping directly from overseas or from a manufacturer to Amazon can use this to reduce their effort level. (Just note that some products can’t be directly imported and shipped to Amazon’s FCs. They don’t have the right permits to receive certain types of FDA regulated goods). With distributed inventory placement (which is standard), you send say 100 units of a widget. Amazon then provides you three or four FCs to send it to, and say perhaps 75 go to FC #1, 15 go to FC #2, and 10 go to FC #3. If you ship to one, of course, all 100 go to that individual FC, and you pay a per-item service fee for this. Note that FBA supports both individual and case-packed products to be shipped to them. These can be shipped either as small parcel deliveries which are more expensive to ship, or as LTL palletized shipments which are often much cheaper to ship. But LTL is slower to receive and tougher for most sellers than just filling up and labeling a box. Most sellers I know don’t have spare pallets or pallet jacks or forklifts lying around. As part of your inbound shipment process, you can enable FBA product restrictions. It is silly to try to ship in items that will be frozen upon arrival, or not received. This is especially common for sellers who ship in Hazmat before adding more details, then it’s restricted after they ship. Make sure everything is filled out first, then ship in. You can use what’s called a 2D barcode to expedite receive with Amazon. Essentially, the barcode holds all important information on the shipment, such as quantities and expiration dates (if applicable), and this allows a reduction in time between receive at the FC and inventory being made available for sale. You will need third party software for these labels, and make sure you follow the instructions to the letter, or it won’t actually speed up anything at receive. I can’t emphasize enough what a horrible idea product repackaging is. Basically, Amazon notes that the product is fine, but the box is destroyed, so they “helpfully” repackage that for you into an Amazon box or an Amazon polybag. Then, they make it available for sale again as NEW. Because there’s a team called Product Policy, who is not even a part of the FBA teams. The FBA teams are who enforce on customer complaints. One of the primary types of customer complaints is “used sold as new” complaints, or customers who are upset because they bought a “NEW” item and then it showed up in less than pristine condition… such as, you know, in a repackaged Amazon box. Product Policy, not being part of FBA, doesn’t understand repackaging. It’s two departments who don’t communicate, and innocent sellers get stuck in the middle. Sometimes Amazon will randomly opt everyone in again, so double check this regularly. There are options for automated unfulfillable destroy orders. Turn these off IMMEDIATELY. If Amazon ever decides to investigate your products for safety, there’s a glitch between the safety investigation teams turning items to unfulfillable during the investigation, and these automated removal orders. It’s okay to automate removals to an address, the worst that can happen is you get your unfulfillable inventory away from Amazon’s hands. For long term storage removals, we’ve had clients run into issues here as well – most of the time removal is fine, but don’t automatically set to destroy, unless you’re willing to lose all of your inventory accidentally, as that is a potential outcome. Be aware, BEFORE you take the risk. I mentioned above that FNSKU is the Amazon Barcode, and manufacturer barcode is the UPC/EAN/GTIN. You cans set a default preference for your inventory. Please note that this is just the default, you will need to set each listing. When the listing has been set, you can convert it back and forth between merchant fulfilled and FBA, but you can’t ever change the Amazon or Manufacturer barcode preference, so make sure you get that part right. Subscribe & Save allows Amazon customers to sign up for recurring, scheduled deliveries of products they use frequently. Subscribers receive a discount of 5% to 15% off their Subscribe & Save orders, as well as free shipping. We love Subscribe & Save!! I was very excited to learn that S&S was being made available to sellers in 2016. Subscriptions are fabulous because they can be set up and forgotten by consumers – any sort of recurring income is great. You do have to meet the metrics requirements set by Amazon to be eligible, and we have had multiple issues with the file upload process not working randomly, so double check the items you submitted for eligibility review were actually received. Note: Starting November 28, 2017, each qualifying product bought at a 15% discount through Subscribe & Save will save you $1.25 in fulfillment fees. This promotion runs through November 27, 2018. If the option to enable Subscribe & Save is not available in your account settings, you are not eligible for the program. The option will be automatically added to your account settings after you meet the above eligibility criteria. Multi-channel fulfillment is another great FBA program that allows you to fulfill all of your sold inventory from multiple channels from your Amazon inventory. Thus, you can connect say, your Shopify store, to Amazon – they ship out for you, tah-dah – no hassle off-Amazon sales. The area this gets tricky is if you’re trying to use Amazon to fulfill your WalMart.com or eBay orders. So far, eBay doesn’t seem to care that much (although we have heard rumors of issues there too), but WalMart.com has apparently been known to be negative towards sellers who use Amazon to ship everything out. So, use with caution, but use liberally, because wow, so much easier than stocking up yourself somewhere. You can also create a customized packing slip – in which I recommend you explain to the customer why the item came in an Amazon box, because yes, they got rid of the plain brown boxes a while ago. Amazon boxes everywhere! The Buyer-Seller Messaging Service lets you communicate with buyers in the Amazon marketplace via Seller Central or your personal or business email. Important: In general, you can contact buyers only to complete orders or to respond to customer service questions. You cannot contact buyers for marketing or promotional purposes (including via email, physical mail, telephone, or otherwise). One cool feature of this tool is that you can set templates for frequently used responses, sometimes also called blurbs. We actually have distilled this into a starter “Blurb Library” for clients, so they’re prepared for whatever may come in on Amazon with a professional and helpful response, no matter how they feel about what the customer is asking. You can also send attachments in the message, up to 10MB, and this is super helpful for information about construction of the product, other things like safety information, things that are critical. Even if a customer has opted out of automated messages, you can still force send a message through Buyer Seller Messages by changing the subject line. Obviously, you can’t abuse this, but for important user instructions or safety guidance, it’s in your best interest to make sure the customer receives the information – for example, if you’re ever sued because the customer installed the item wrong, you can prove they were provided with instructions in the box and electronically. You can choose to have Amazon handle your customer service, but we do recommend handling it yourself if you can at all do so. You know your brand better than an entry level employee overseas. We do generally recommend enabling your export settings, although not for items that are likely to get stuck in Customs in the destination country and not make it to your customer. Since this is an account wide setting, if you have any products with distribution limitations or regulatory compliance issues, you won’t be able to enable export. Amazon Giveaway is a service that makes it easy for Amazon customers to set up and run promotional giveaways. We see no reason why sellers shouldn’t enable this – if someone wants to use your product as a giveaway, why not let them?? I hope you’ve found this rundown of FBA settings useful – please leave any questions or comments in the box below. Does this sound like you? “You know what? I kind of am not a fan of dealing with Amazon, although I recognize the importance of being on and using the platform.” If so, we’d love to discuss our management support plans with you!